(Woodstock NY) – May 16, 2007: Talk about a match made in heaven! Innovator of what has become known as the Cosmic ‘60s art movement, Peter Max has created this year’s official commemorative Woodstock Film Festival poster. "Woodstock is synonymous with creative energy, rock-n-roll, and free spirits,” said Max. “This tradition continues with the Woodstock Film Festival and all of the wonderful, independent film makers it is featuring and supporting." “This is a very small run of prints and an amazing opportunity to own a real work of art that is significant to the Woodstock Film Festival as well as the area’s history and the town itself,” added Blaustein. Max’s collaboration with Woodstock is long and varied. In 1989, he created the world’s largest rock-and-roll stage for the Moscow Music Peace Festival, set to coincide with the 20th anniversary of the Woodstock Music Festival. Then, in 1999, Max set a record (beating his own) for painting the largest mural: a 600-foot stage for the 1999 Woodstock celebration. 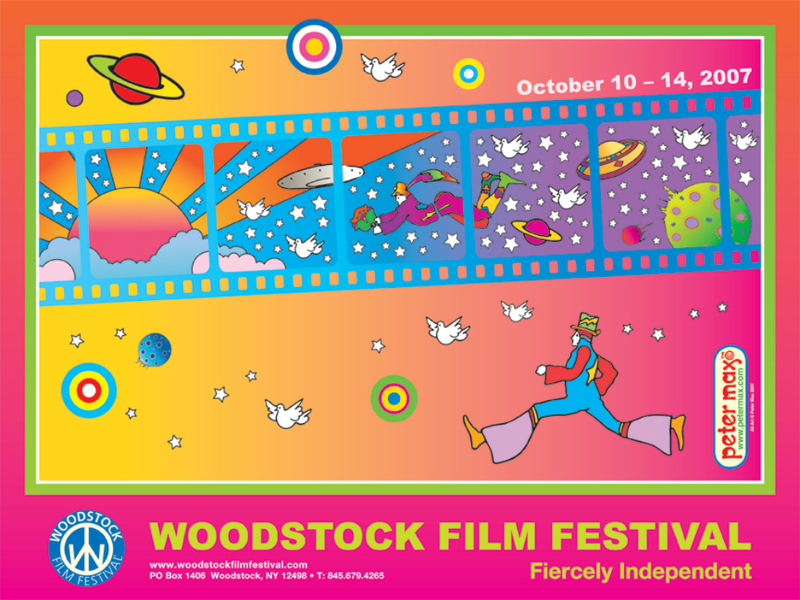 The eighth annual Woodstock Film Festival takes place October 10-14, 2007. The ‘fiercely independent’ event will include more than 150 films, panels, concerts, and special events that will be featured at venues in Woodstock and the neighboring towns of Rhinebeck, Hunter, and Rosendale. Over the years, the Woodstock Film Festival has established itself as one of the best independent film events in the country by premiering exceptional films, hosting the most talented emerging and established professionals in the movie industry, presenting A-list concerts, parties and panels, and creating stimulating year-round programming.